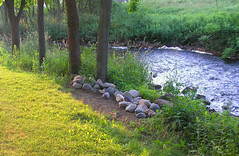 Early on Thursday morning the Longfellow poem "Song of Hiawatha" came to life for me as I walked along the creek that runs to the Mississippi River. 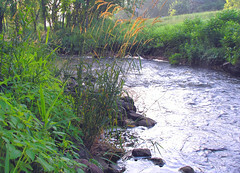 Minnehaha Creek winds its way from Lake Minnetonka to the Mississipi River. It leaps briefly over Minnehaha Falls. 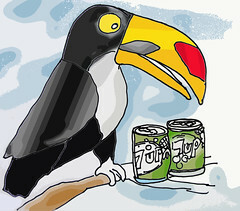 Tropical fun from a diet 7 up addict. - Island fruit flavor - with calcium, no less. The passing of two of our three dogs during the last 3 months has caused us a lot of sadness here, and left us with an emty feeling. The cure? A new puppy and friend to "Rocky", our loyal male Corgi/Shelty mix. We are planning to pick a puppy up during this extended 4th of July weekend. A female Shelty from a good breeder. We are already in the process of naming her. FYI- Here is the list of top female dog names in the USA (from the Petsmart Bow Wow website). I have a cartoon dog that I call Tonky - but it is just that, an odd cartoon dog. From personal visual observation on Gray's Bay, the following preventive treatment program seems to be working to control Milfoil. - I can only watch and observe the results as the season progresses. 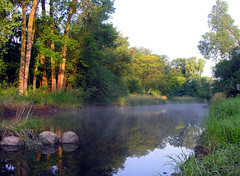 The author states the cost of current harvesting techniques, (squads of milfol harvesters) but does not realistically cover the cost of the chemical treatment program being studied, or more important, the impact these chemicals may have on the lake environment. - Just don't try this at home. 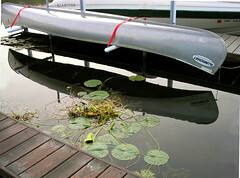 "Almost 20 years ago, Eurasian water milfoil first invaded the lake. 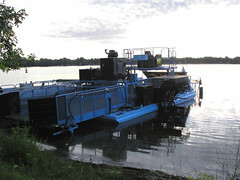 Now, each year men on large floating harvesters spend the summer pulling mats of milfoil from 500 acres of the lake, just to keep navigation channels open. And the following year, the milfoil grows back. This year, the Lake Minnetonka Conservation District is testing what could be a permanent solution to the milfoil problem. On three bays of the lake, the LMCD is testing chemicals designed to kill off the plant. But there is also a debate on the lake about how much the LMCD can and should be doing about future threats from invasive species, especially the zebra mussel." 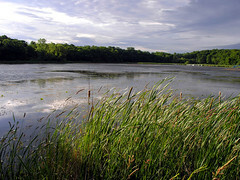 "This spring, for the first time, the LMCD, along with the Lake Minnetonka Association, private lakeshore owners, and the Department of Natural Resources is testing chemicals to control milfoil on parts of Phelps Bay, Carmans Bay and Grays Bay. Different chemical combinations are being tried on different bays. It's too early to tell whether the herbicides will be successful." If one formula works, it could be tried on the entire lake, Skramstad said. Though the LMCD, funded by 14 lakefront cities, has a tight budget, Skramstad said he's confident the money needed -- which could amount to hundreds of thousands of dollars -- could be raised. It already costs about $100,000 a year to harvest the milfoil that grows back each year. Osgood said it's unlikely milfoil could ever be eliminated from Lake Minnetonka. But, he said, "I think long-term, widespread control is possible." Monday, Monday. 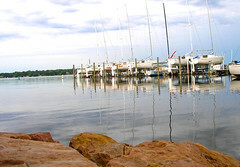 All quiet in the Wayzata Marina. Previously Called Tricon International. Now named - "Yum!" 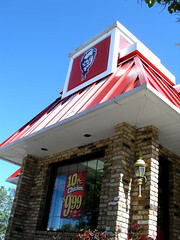 this restaurant conglomerate owns: A&W, Kentucky Fried Chicken, Long JOHN Silver (don't get that one wrong please), Pizza Hut, and Taco Bell. "The power of our people is our secret ingredient, and what sets us apart from the competition. 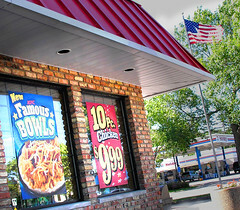 Around the world, our 900,000 Customer Maniacs are striving each and every day to put a Yum! on our customers' faces. We train our team members once a quarter on how to be Customer Maniacs." So try this new KFC Classic Bowl: Signature mashed potatoes, sweet corn, fried chicken nuggets, all covered with their special gravy... then to top it off 3 cheeses! Available at KFC on Wayzata Boulevard - across from Lunds. Mashed Potato bowl with Gravy: 690 Calories. Add the corn, fried chicken nuggets and top with three cheeses - It nears 1000 healthy calories. Anywhere USA. Yum! There are a few "Yums" on Wayzata Boulevard. Turn on the tube and watch a "Yum" commercial. See the baffling food photography...it begs the question: Has this been cooked? Tired of this worn out phrase? You hear it constantly on the radio, whether it is talk radio or NPR's "call in" radio. Try your own version. "Be Careful what you fish for..."
"Be careful what you wish for, you just might forget it"
"Be careful what you wish for, you just might you may not be able to down load it onto your Blackberry"
"Be careful what you wish for.... is that my cell phone ringing or a dog whistle?" During a brief stop this morning in Tonka Bay I searched for creative boat names. I was dissappointed and found only a few worth even shooting. I liked the presentation of "Northern Exposure" with its woodsy appearance. 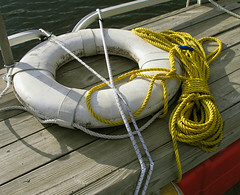 I have to chuckel at the confidence of the aging pontoon boat called "Playbuoy" (unpictured). Another shown here is "Cram-alot-Inn"- self explanitory. 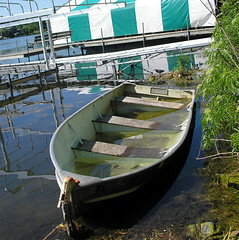 "Minne Tonka Toy" is aptly named for the size of the boat and the nearby Tonka Toy location. My search for clever boat names continues. 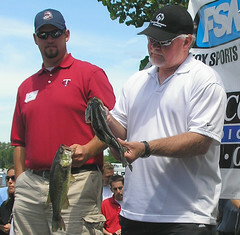 Ron Gardenhire examines his catch. "Looks pretty foul to me" He said. Ron restrained himself from the exagerated arm gestures that got him thrown outof Sunday's winning game. He can chew snoff and fish for Bass at the same time! I am going to stop by and see if I can get a few pictures this afternoon. 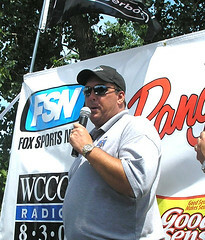 • KENT HRBEK OUTDOORS BASS FISHING CLASSIC - (8:15 a.m. - 3 p.m.) - Former Twins' first baseman Kent Hrbek will host the Kent Hrbek Outdoors Bass Fishing Classic on Lake Minnetonka. 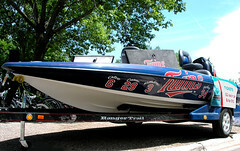 The event is presented by Ranger Boats and Yamaha and benefits the ALS Association, Minnesota Chapter. Hrbek will be joined by current and former Twins along with other local celebrities. Registration begins at Maynard's Restaurant on Lake Minnetonka in Excelsior at 7:30 a.m., with the tournament taking place between 8:15 a.m. - 1 p.m. There will be a weigh-in, lunch, and awards ceremony open to the public at Maynard's from 1 - 2 p.m. Shot from under a bridge looking out. I have never written about fishing on Minnetonka, so I borrowed this information just to give the novice an idea of what 'real fishermen" think about Minnetonka. I should have guessed it was a Bass haven by the $100,000 dollar bass boats lined up at the marinas on any given weekend. 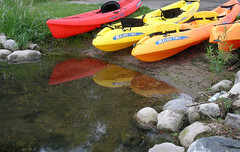 14,310 acres; series of small lakes connected by short canals, heavy milfoil, boat docks, rocks, deep water. Rare, indeed, is a lake situated practically within the city limits of a major metropolitan area that ranks as one of the nation’s better bass fisheries, but Lake Minnetonka, located only a dozen miles from Minneapolis, can be classified just that way. 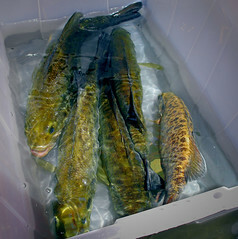 Both largemouth and smallmouth bass are present in huge numbers and very respectable sizes here; in fact, largemouth weighing 6 pounds are not at all unusual. 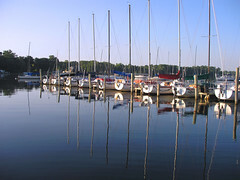 The reasons for Minnetonka’s success can undoubtedly be linked primarily to the lake’s heavy growth of Eurasian milfoil, and secondly, perhaps, to the lake’s unusual configuration. 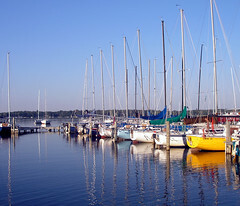 Actually, Minnetonka’s 14,310 acres spread across more than a dozen separate lakes (most are actually named bays on the lake maps), all connected by short canals. The entire complex fits within an area just 11 miles long and six miles wide, and embraces 110 miles of shoreline. A lovely little setting that many of us rush by every day. I was attacked by geese while running here once. Or is it a submarine wanna-be? Harper Road is on one block long hill. Two cars cannot pass each other if they meet on Harper Road. 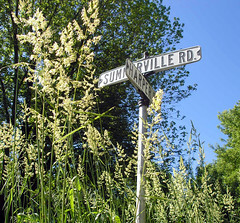 Carver County, to the West of Lake Minnetonka is a beautiful county with rolling hills, lakes and the most beautiful parks one can find. 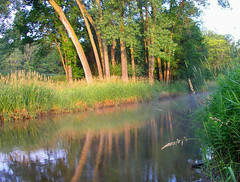 I particularly enjoy the Carver County Reserve with its broad prarie expanses, trails and wetlands. 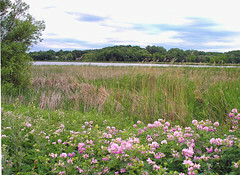 When one travels to the West side of the Lake, there is a distinctive 'rural Minnesota" feeling (my opinion). 1. On March 3, 1855, the Minnesota Territorial Legislature organized Carver County with a population of 352. 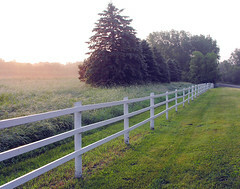 The Villages of Chaska, Carver, and San Francisco were founded prior to Carver County. 2. In 1856, the county's first murder trial was argued. John Schlemline was accused of murdering Nicholas Barton near Chaska over a land claim dispute. Schlemline was acquitted. 3. 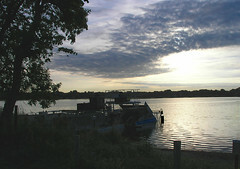 During the Dakota Conflict of 1862, many settlers sought protection on Coney Island in Lake Waconia. 4. 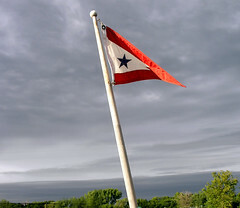 During the Civil War, 588 county residents served in the Union Army. 5. The county experienced a grasshopper plague in 1870. 6. Watertown Bell Factory, the only bell factory in the state at the time, produced 4,000-5,000 bells per year. 8. Mayer enacts law to bar livestock from running loose on the streets in 1908. 9. In 1908, Bongards Cooperative Creamery was organized. First off, you must know that my MS150 is next weekend (June 9 -11th). I am 53, and this may be a tough one. I have one final long training ride ahead. I will be posting photos of my trip on my blog and FlickR "real time" - so watch for it. 1. Put your foot on top of the pedal. Push down. 2. Place your foot into "stirrups" or "rat traps". These do not lock your feet in, but allow you to better use the full circular pedaling motion. This is what I use, and recommend. Practice the upswing! Practice taking your feet in and removing them from the stirrups. 3 Racing shoes with metal posts that 'lock' feet into the pedal. These are for the 'guys' you see rocking back and forth at stop lights. Not for touring riders, and touring is what you are going to do. Jane, these rat traps are the best, - or safest. 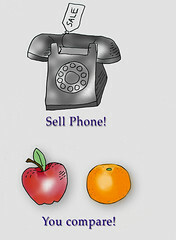 Here is another suggestion that might surprise you - Get a bell! Funky yes, practical - yes! Unless you enjoy yelling a lot.